Engineer responsible for design and development of World Wide Web based high transaction volume, database applications in Oracle using C , perl and PL/SQL.Also conducted in house training and frequently served as liaison and interpreter between engineering, marketing and management. Rapid progression through increasingly responsible positions at this major research university and 560 bed hospital with over $300 Million in research funding, 730,000 patient visits and schools of Medicine, Nursing, Dentistry and Pharmacy.Originally recruited to establish a new unit supporting research information system needs, the role expanded to include responsibility for all OHSU activities on the web and finally the formation of a new division within the Information Technology Group incorporating both the Web and Research units along with a third unit responsible for collaboration and workflow systems. Expertise Management and Collaboration - Created a system of expertise repositories for researchers, physicians and educators managing CV’s, biosketches, publications, funding, internal and public profiles.Introduced Web 2.0 and semantic technologies to facilitate collaboration.Created a web-based “technology portal” to promote technologies available for licensing and manage material transfer agreemenh0 h0 ts.Lead institutional participation in the InCommon Federation for multi-institution collaboration. Research Support – Created comprehensive Electronic Research Administration infrastructure managing the full research lifecycle from all perspectives, including compliance, finance, reporting and disclosure.Advised laboratories and research centers on application of information technologies to facilitate research.Directed the integration of the EPIC electronic medical record with the clinical research enterprise. Information Systems – Responsible for all information systems supporting the management of the University IT infrastructure including change management, request management, ticket tracking, cable and telecom management and project tracking. Web and Intranet - Instigated and directed the successful execution of a full redesign of the institutional web presence and strategy.This included creating visual identity guidelines, a unified information architecture, a multi-tiered, content management system-based infrastructure, enterprise search and web analytics and migrating legacy content and applications to the new environment. Organizational Development and Restructuring – Lead the creation of three new departments including Research Information Systems, Web Strategies and Business Operations tools, culminating in a new division Research and Collaboration Systems.Member of the OHSU Leadership Team, an advisory council assisting in the development and execution of institutional strategy, including two major organization-wide restructures. Lecturer in Masters level courses in Applied Information Management delivered in both classroom and distance learning settings.Developed online course offerings including discussion forums, distributed team projects and peer-review mechanisms.Also mentor and advise students on “capstone” projects. Established internal Digital Asset Management and Information Quality policies and procedures including metadata architecture governing all corporate data assets. First ever recipient of CenterSpan“SuperStar” award for outstanding contribution. Functioning largely as an internal consultant leading architecture and modeling efforts, technology evaluation, solution development and process reengineering, often serving as interpreter and mediator between management, engineering and executives.Responsible for major architectural IT initiatives for both internal and external clients. Architect and Project Leader for complete re-engineering of enterprise data management systems.Architected and directed development and deployment of the Acxiom Data Component Architecture governing all data acquisition, processing, storage and manipulation within Acxiom. Lead system design and implementation efforts for external clients including Chase, Fidelity, Merrill Lynch, American Express and Blockbuster among others. Director and principal architect of the Pennsylvania Education Network Digital Object Repository (PEN-DOR), a statewide, multi-media digital library project.Conducted research in distributed digital library architectures, object database design, resource identification and discovery in distributed systems, and user interface design.Managed four Ph.D. level and three Masters level research assistants.Also responsible for budgeting, reporting and frequent public presentations. Dissertation “Establishing the Impact of Supporting Persistent, Location Independent, Identification ofResources in Large-Scale,Heterogeneous, Distributed Systems.” Univsersityof Pittsburgh, Pittsburgh, PA. 2000. 20090055506 Centralized selection of peers as media data sources in a dispersed peer network 26 February 2009 Inventors: Michael D. Hudson Brian L. Windheim Darin Stewart Sudhir Menon Mark W. Goschie Glen Curtis Shipley Agents: KENYON & KENYON LLPOrigin: NEW YORK, NY USIPC8 Class: AG06F1516FIUSPC Class: 709208 Abstract: A hierarchical content distribution system includes a seeding server, a plurality of geographically distributed content platforms, and a distribution controller, all interconnected by a communications network. The seeding server initially receives content files for distribution to various content platforms that provide for the persistent storage of the content files. Each content platform includes a content file server responsive on-demand to requests for the transfer of content files. The distribution controller autonomously monitors the transfers of content files and selectively issues transfer directives to the content platforms to modify the distribution of content files among the content platforms. The content file servers respond to received transfer directives by issuing requests for the transfer of the directive identified content files, thereby conforming the specific distribution of content files to an optimal distribution pattern as determined by the distribution controller based on usage patterns. 20090049185 System and methods of streamlining media files from a dispersed peer network to maintain quality of service19 February 2009 Inventors: Michael D. Hudson Brian L. Windheim Darin Stewart Sudhir Menon Mark W. Goschie Glen Curtis ShipleyAgents: KENYON & KENYON LLPOrigin: NEW YORK, NY USIPC8 Class: AG06F1516FIUSPC Class: 709231 Abstract: Media content, including content suitable for streaming, is distributed to and accessible over a communications network by computer nodes within a peer storage network of computer nodes hosting respective content stores. Discrete portions of a content file are multiply distributed to and persisted in a distributed set of the content stores existing within the storage network such that various content stores persist subsets of the content file portions. A computer node retrieves the discrete portions of the content file from the various distributed content stores, depending on node availability, the particular discrete portions there available, and node and network performance factors sufficient to maintain a minimum quality of service, thereby enabling streaming presentation of the content file on the requesting computer node. "Socialized Medicine: How Personal Health Records and Social Networks are Changing Healthcare." eContent September 2009 “XML-Empowered IntranetTaxonomies.” Intranets Today. 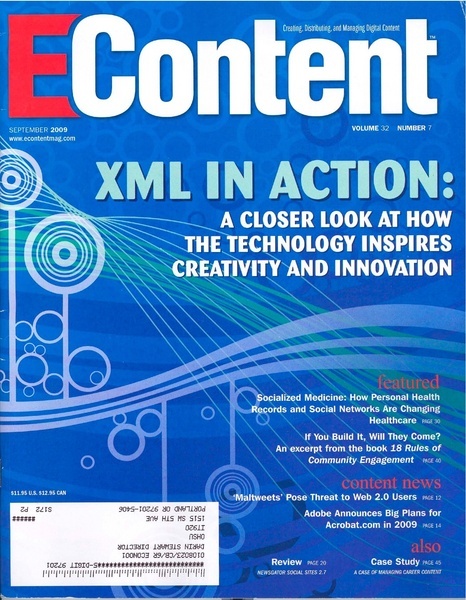 May/June 2007 “Why Taxonomies Need XML.” eContent. May 2007 “The Document Dilemma: Solutions for Electronic Research Administration. Pt. 2.” Document. February 2005. “The Document Dilemma: Solutions for Electronic Research Administration. Pt. 1.” Document. December 2004. “XML for Music.” Electronic Musician. 5 December 2003. “Digital Rights Management.” ElectronicMusician. 2 July 2002. “Fair Use in an Online World.” Electronic Musician. 2 July 2002 “Infrastructure Intelligence.” Intelligent Enterprise. Vol. 5 No. 17, 30 October 2002 “Flow Control : Actionable Digital Rights Management Strategies.” Intelligent Enterprise. Vol. 5 No. 4, 21 February 2002. “To Protect and To Serve:Consumer Preference Management and Privacy Law.” Intelligent Enterprise. Vol. 4 No. 10, 29 June 2001. "Taxonomy101: Controlled Vocabularies as Stepping Stones to Semantics.” Semantic Technologies Conference. San Jose CA. 15 June 2009 (upcoming). “Taxonomies and Vocabularies as Stepping Stones to Semantics.” Semantic Technologies Conference. San Jose CA. 21 May 2008. “Introduction to Taxonomy Development.” Writers UA Conference. Portland, Oregon. 19 March 2008 “Taxonomies and Vocabularies as Stepping Stones to Semantics.” Semantic Technologies Conference. San Jose CA. 19 May 2007. “Using XML to Structure and Manage Taxonomies.” KM World - Taxonomy Bootcamp. San Jose, CA. 3 November 2006 “Software Internationalization.” Technical Resources Network Symposium (TresNet2000) Little Rock,AR. 12 September 2000. “PEN-DOR: An Object Based, Distributed Digital Library Architecture in Support of Transient Document Instances.” Object-Oriented Programming Systems,Languages and Environments 1997. (OOPSLA '97) Atlanta, Georgia.5-9 October, 1997. “Digital Libraries for the K-12 Environment.” 1998 Annual Meeting of the AmericanSociety for Information Science. (ASIS ’98) Pittsburgh, PA. October 24-29, 1998. (Panel Member). "The Pennsylvania Education Network Digital Object Repository System(PEN-DOR)." Three Rivers Educational Technology Conference, Pittsburgh,PA. December 1997. A creative and disciplined leader in information and knowledge management with extensive experience in strategy, administration, consulting and large-scale project management. Ph.D. in Information Science with expertise and numerous publications in strategic information policy, process optimization, information quality, and web-based systems. Has successfully developed, and deployed information and knowledge management architectures in both commercial and academic environments. Stewart, Darin & Fullerton,Karen. “Building the World Brain:Establishing A Global System of Network Accessible Education ResourceCenters.” Proceedings of the 1998 International Conference on Computers in Education. Beijing, Peoples Republic of China. Bright, M., Fullerton,K., Rasmussen, E., Stewart, D. "The Pennsylvania Education Network Digital ObjectRepository (PEN-DOR): an Object Based, Distributed Digital Library in Supportof Curriculum Development." International Symposium on Research, Development & Practice in Digital Libraries: ISDL97. November 18-21, 1997. Tsukuba Science City, Japan. Stewart, Darin. “The Virtual Teachers Lounge: EnhancingPublic Education Through Social Capital, Community Memory and the Digital Library.” Proceedings of the 1997 International Conference on Computers in Education. Kuching, Sarawak, Malaysia. Spring, M., Fritsch, R., Lautenbacher,G., Lenox, T., Morse, E. Sapsomboon, B.Stewart, D. Vathanophas,V. Embodying Social Capital Facilitators in a Collaborative Authoring System. Proceedings of the Association for Information Systems 1997 Americas Conference. Indianapolis, Indiana,15-17 August 1997. Palowitch, Casey & Stewart,Darin. Automating the Structural MarkupProcess in the Conversion of Print Documents to Electronic Texts. Proceedings of Digital Libraries 1995, Austin, Texas. 11- 13June 1995.